Trump warns about this often and with increasing urgency, but I wonder how many voters outside his base find it believable. I’m talking about the ones who can still make a difference in this election, the “never Trump” conservatives and the undecided moderates in both parties who, against their better judgment, are leaning toward Hillary Rodham Clinton – or washing their hands of both nominees. Many brave GOP candidates for House and Senate have stood with Trump through withering fire because they understand the alternative. Too many of us don’t. Too many voters ignore the ominous warning signs – based on the past and current behavior of my party, the Democratic Party – that a two-term HRC presidency may end up looking more like tyranny than democracy. Call this a thought experiment, but if what follows here is even remotely possible, then neutrality is not an option. Yes, I know most Americans have trouble believing something so dire could happen here in “the land of the free.” First, we’re used to being powerful; second, we’re rightly proud of our great political system; and third, we don’t really understand how tyranny operates, or even what it would look like in a country such as ours. Back in July of 2000, well before that troubled election, I was up against this same wall of disbelief, raising alarm to mainstream Democrats about what was transforming our party. Using Newsweek’s 1990 “Thought Police” cover story as a starting reference, my column warned that too many of my party’s leaders had disconnected from America’s political roots – especially during the Clinton years – and were part of a growing “politically correct” movement, which Newsweek described as “Marxist” and “totalitarian.” If this was so, I said, then it was bigger than the Clintons themselves, and younger leaders would be found to carry the PC flag into the future. Now 16 years later – and after eight years of Barack Obama – it’s clear to me that unless Americans wake up and unite as a powerful political resistance, the return of the Clintons to the White House could ultimately make my cautionary concerns about the rise of tyranny look more like prophecy. Actually, the ancient word “tyranny” doesn’t cover the full range of possibilities discussed below. Newsweek uses the modern word “totalitarian,” which is more accurate. Since the last century, governments have been able to maintain total control over every aspect of a citizen’s life – if given the power. Up to now, Americans have resisted government intrusion. We’ve read books describing the horrors of totalitarianism, like “1984,” “Brave New World” and “Darkness at Noon.” They made clear what was so dangerous about centralized power, but ironically, what was true in the 20th century is chillingly more true in this age of high-speed digital information and smart technology. The seven pillars briefly covered below will help define the fight we must all win to save our republic from “politically correct” totalitarian rule. It won’t be an easy fight. Our greatest Cold War president, Ronald Reagan, well understood the amoral mindset of Marxists, including their willingness to commit crime, lie or cheat in order to achieve their goals. It was something he addressed often, even in his very first press conference. 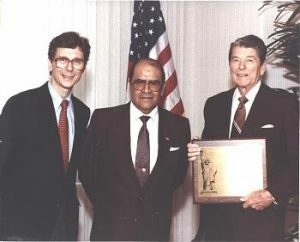 Reagan recounts this moment in a 1983 speech to the National Association of Evangelicals, a group he knew would understand something the secular media couldn’t see – the moral dangers America faced, not only from international communism as led by the Soviet Union, but also from sympathetic forces within our own country. Only a few years later, Newsweek described a new form of totalitarian thought, which was having an increasingly powerful influence. It was rooted in a different kind of rebellion, but like classic communism, it also sought a new order. You’ll notice in this quote below the same attitudes and beliefs that are at work in America right now. Ironically, we are having the same trouble seeing them for what they are. You’ll immediately recognize the importance of this last line as it relates to “losing our country.” Yes, we have fellow citizens who “hate the system.” But now they are not just on college campuses; they are at the highest levels of power, from media to government to entertainment to business. These are not bad people. Most of them genuinely want to do good – they just don’t know what “good” really is, as you’ll see. I will try here to depend more on common sense than on references. There’s plenty in the news on a regular basis to help persuade the reader of what I say. Yes, it’s hard to believe fellow Americans would pursue such an un-American vision as PC Marxism, but again, they see it as good. And make no mistake, they’re absolutely dedicated to what they believe. They are also completely convinced that if you don’t agree, you must be defeated so their vision can be realized. Here are the pillars needed to hold up their utopian dream. As with any weight-bearing system they are interdependent. I want you to know that this administration is motivated by a political philosophy that sees the greatness of America in you, her people, and in your families, churches, neighborhoods, communities – the institutions that foster and nourish values like concern for others and respect for the rule of law under God. Now, I don’t have to tell you that this puts us in opposition to, or at least out of step with, a prevailing attitude of many who have turned to a modern-day secularism, discarding the tried and time-tested values upon which our very civilization is based. No matter how well intentioned, their value system is radically different from that of most Americans. And while they proclaim that they’re freeing us from superstitions of the past, they’ve taken upon themselves the job of superintending us by government rule and regulation. Sometimes their voices are louder than ours, but they are not yet a majority. Granted, at this point in our history, secularists may seem in control because of the loud voice of the popular media culture. But even decades after Reagan’s famous speech, I don’t believe PC secularists are a real majority, no matter how the vote turns out. Why? Because there is so little truth being discussed in the PC media culture these days. Do we really think younger Americans understand this election? For most of us, this seems an unreal way to live, but for these kinds of people it’s how they “protect themselves” from a world they fear – and for a world they want. You may question how much this character trait applies to Hillary Clinton, but there’s no doubt it describes the PC left exactly. An HRC administration will continue the process the Clintons started in 1993 by filling the bureaucracy – from the FBI to the CIA to the Pentagon to the IRS – with Clinton loyalists and PC acolytes. It follows logically that weaker bureaucrats, agents, military officers and others willing to “go along to get along” will stay on, but only true believers are likely to control key management positions. Those overtly not “on the team” will be “retired out” as quickly as legally possible – some not only removed, but scandalized as were White House travel office employees only months after the Clintons rose to power. It has been said the Clintons operate like a “crime family.” Now increasingly the entire bureaucracy will. Transforming the electorate: Along with packing the courts with like-minded lawyers, the PC left bureaucracy will continue the process of packing the electorate in every way possible, including allowing convicted felons to vote, but starting with naturalizing illegal immigrants who, as statistics show, are also likely Democratic Party voters. Of course, all this will follow fast-tracked “comprehensive immigration reform,” allowing for more legal immigrants as well – who will be naturalized, registered and readied to vote. It’s foolish to think the left will not play hardball in this way, especially for those of us who lived through the 2000 election. After all, the stakes are high. Polls indicate that even solid red states like Texas and Arizona could be turned blue in just the way California was – with enough new “likely Democrat voters.” It doesn’t take much imagination to see what a future electoral map will look like. Once the national elections are secure, leftists in power will be bolder in pursuing their vision for a greater, more egalitarian America, as they see it. When they use words like “transform” and “re-imagine,” we should take them seriously. Transforming Republicans: Frightening as it is, the left’s growing contempt for traditional Americans, Catholic and otherwise, is something believers – Democrat, Republican or independent – must face together. Again, it is an ideological conflict. Democrats like Gov. Martin O’Malley (a 2016 presidential candidate) are serious when they use the word “fascism” to describe their opponents. This helps explain their behavior. Think of what they did to destroy Republican congressional leader Tom DeLay, who was falsely accused of malfeasance and removed from power. He spent years in court, and although exonerated, still had his life turned upside-down. Meanwhile, other Republicans got the message. As the left gains power, it will not only use the IRS against its “enemies,” as it scandalously did against tea-party groups to improve Obama’s chances for a 2012 victory, it won’t hesitate to use other agencies. Why not use the FCC to squash “the bigots” of conservative talk radio or whatever? The possibilities for intimidating enemies are endless, especially once the bureaucracy is full of PC loyalists. Wall Street Journal columnist Kimberley Strassel’s 2016 book, “The Intimidation Game: How the Left is Silencing Free Speech,” exposes the kind of strategies the left generally uses to stifle debate, intimidate corporations, silence conservative donors and shut down activist groups who threaten the new order. If we continue to go down this path with Hillary Clinton, fear will ultimately rule in Washington. Over time, it’s not hard to imagine that one day even conservative Republicans will modify their opposition to the established power enough to render them (and the legislative branch) nearly useless as a check on executive overreach. After all, what other options would they have? All avenues of redress would be blocked – even the media. Forget calling journalists to expose corruption among the powerful. Those days would be over. Transforming society: Political reality follows the popular media culture, and the media culture follows the corporations who own it. It has been said by experts on totalitarian thinking that after propaganda is used to gain control, it then becomes overt indoctrination. This was previously unimaginable in America, but now that most in the corporate media and the “groupthink” popular culture have unofficially declared allegiance to my party, we can expect only greater compliance, especially as the Supreme Court recreates the moral order. Eventually the culture’s compliance could cease being a choice – and friendly “groupthink” academia won’t escape either. Once tuition is “free” (if the left has its way), colleges and universities will be hardly more than clients of the state. Then we can expect the noose to tighten even further on academic thinking. Ask yourself, from private schools and homeschooling to talk radio and Christian programming, what happens to dissent when it’s redefined as “bigotry” and codified as “hate speech”? And predictably, there will be plenty of support for this among millennials, most of whom apparently have long since submitted to PC thinking. Unsurprisingly, they also have a fairly ignorant view of socialism – the scourge of the 20th century. Transforming government: If those on the left achieve their oft-stated goal of national health care (now as a “fix” to the Obamacare meltdown), they will not only control one-sixth of America’s economy, but they will also be making decisions on your personal health care (a reason to remain “cooperative”). They will likewise gain access to private information on most citizens, and the influence that goes along with it. Potentially, after all, information is intimidation – an actual threat is usually unnecessary. Older Americans will remember that “confidential” FBI files about leaders from previous GOP administrations (Reagan and Bush 41) somehow found their way into the first Clinton White House. These were raw files full of possibly embarrassing information compromising Republicans who may otherwise have resisted the left with more vigor – but preferred to keep, say, an extramarital affair out of the front pages. Sound familiar? Transforming neighborhoods: As Winston Churchill famously warned and as history demonstrates, by whatever method, totalitarian leaders must eventually exert influence in the streets. Anyone paying attention to the news recently was likely shocked to hear that a bullying, socialist group like Black Lives Matter would be given access to $100 million, pledged by various famous foundations, including major Democrat allies. Their violent street demonstrations, rooted in lies and sometimes calling for cop killing, have led to a hostile and debilitating environment for America’s law enforcement, the heart of local order. Theoretically speaking, groups like these can be useful in “organizing” neighborhoods in “Saul Alinsky” fashion. Anyone who has experienced a mob gathered outside their home (a common practice of the left) knows what intimidation means – and understands the power of a well-funded local bullying group. The fact that Donald Trump’s rallies were infiltrated and intentionally undermined by street thugs – bought and paid for by Democrat operatives, one of whom had over 40 Oval Office meetings with President Obama, and hundreds more elsewhere in the White House – should wake up even the sleepiest American. This kind of agitprop intimidation can easily be brought to bear in any neighborhood for any political purpose. Even local police departments, who often depend on federal funding grants, can be transformed and controlled by a corrupt Justice Department, all in the name of civil rights. People already live in fear of the racist label, but each questionable shooting by a local cop (and as a matter of process, they are all questionable) can lead to a federal “investigation” with a motive to raise up loyalists. Generally speaking, Heather Mac Donald’s 2016 book, “The War on Cops,” makes clear that a gross injustice is being done to men and women of all races who risk their lives for the rest of us. But it’s not about justice or race. It’s about power – and local control. The only question is: Will we submit, and how long will it take if we do? As I wrote 16 years ago, this is not about the Clintons. So whether HRC is elected or not, the PC Marxist movement will continue until regular Americans – of all parties, races, colors and creeds – have an honest dialogue about what these so-called liberals really represent. However, it must be said that eight years of President Hillary Rodham Clinton will likely move our country dangerously close to the point of no return. I wish I could say these seven pillars are an impossible nightmare scenario, but a quick search on the Internet (or exploring the links provided) will tell you they are not. Yes, this may be hard for you to believe, but military strategists have a sound wisdom when it comes to measuring threat level: Don’t judge motives, which are usually obscure; judge prior behavior and the existing capacity to do you harm – and prepare to stand against that. Whatever our government’s pronounced motives, if we see these pillars being put in place, then we must resist with determined political action. Otherwise we’re establishing an enormous power over our lives with only “blind trust” to protect us. I ask all undecided voters or “never Trump” Republicans to consider these seven pillars of transformation. If you think they are at all possible, then how can it not affect your vote? Many of us who see these stark dangers hope against hope for a major press conference – and that walking onto the stage with Donald Trump will be governors Mitt Romney, John Kasich, Jeb Bush and all the many others, perhaps including some “never Trump” pundits. Imagine them gathered there to raise the alarm by making a simple statement, point by point, starting with the dangers of a Supreme Court that serves the left’s PC ideology rather than the Constitution. This election could well decide if we are to “remain America” or go down the path of PC Marxism that Newsweek warned us about in its “Thought Police” issue over a quarter century ago. The time is now for a unified call away from the political abyss. Of course, if there were such a press conference, the entire mass media pop culture would scream at the top of its lungs that this was merely a sellout for power. But here’s the point: Win or lose, Americans would remember the moment. And if we must endure an HRC presidency, at the very least, no one could say to Republicans, “Why didn’t you tell us? Why didn’t you warn us?” You Republicans warned us about Obamacare every step of the way. So warn us again now. I have stayed a Democrat all these years because I know we Democrats need to have a real conversation about how our party can recover from its Marxist transformation. This is why I’m launching my Democrats for America.com blog here in this column.